A few years back, Kathy Rolin, a Coast Guard veteran, attended an event where bugs were on the menu. Rolin was intrigued and wondered if a cricket farm had legs. (SORRY for the pun!) After that, Cowboy Crickets took off (ok, last one). Rolin and her husband James, also a Coast Guard Veteran and PBC Denver alumnus, decided to “change the way we eat and help make eating insects more acceptable,” said Kathy Rolin, co-founder of Cowboy Crickets. They aren’t alone in their journey as, according to a report by Global Market Insights, the world edible insect market will exceed $710 million by 2024. “We truly believe in what we’re doing,” said James. 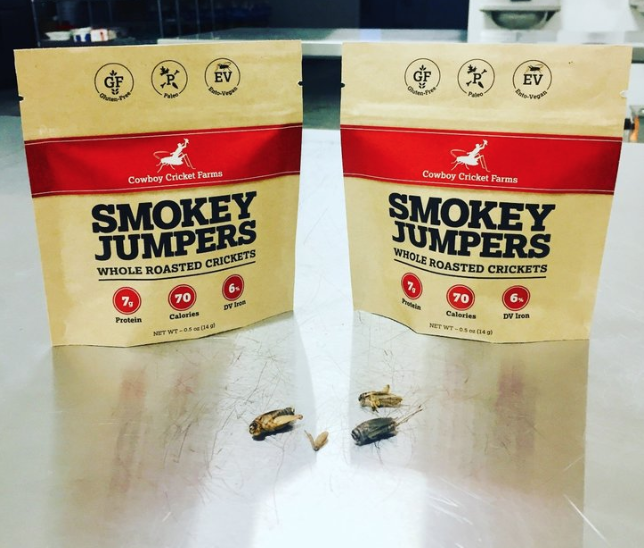 Cowboy Crickets processes crickets farmed to their requirements by partner farmers in Montana, California, Arkansas, and Texas and sells several products to specialty food stores and other locations. The duo attended PBC Denver and took home 2nd place in the pitch competition, along with advice, motivation, and the relief that they aren’t alone in the entrepreneurial journey. “And the mentors totally get it and had thoughtful advice,” added James. They’d both love to see the pitch competition be a bigger part of the weekend, although the 2-minute time frame was ideal. The cowbell (that signals competitors have reached the time limit) garnered lots of laughs, as well. After Denver, the cricket team won $25,000 in the Greater Philadelphia Veteran Shark Tank competition. Perfect timing, said James. “That money is a 3-month runway to make changes, get sales boosted, and improve our marketing,” said James. Speaking of marketing. Ready-to-use flour, protein pancake powder, and three new flavors of whole-roasted jumpers (tropical, cinnamon, and wasabi) are headed to market. They join the current family of products: chocolate chirp cookie, smoky-flavored jumpers, and ground cricket powder. Despite having made huge strides and progress early in their entrepreneurship adventure, it isn’t for everyone admitted both James and Kathy. But having the military veteran spirit and a deep conviction in the company’s mission makes all the difference.